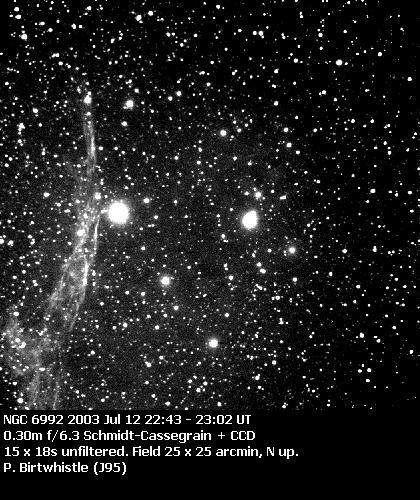 2003 MK4 was passing through Cygnus at 10 arcsec / minute when it was caught against the backdrop of the northern extremity of the old supernova reminant NGC 6992 (long smudge at left). 52 Cyg is 7 arcmin out of frame to lower left. The asteroid was listed as a virtual impactor for about three weeks following its discovery on 28 June 2003, but subsequent astrometry allowed the orbit to be refined enough to show that it will not hit the Earth, though it is still predicted to pass by at less than half the distance of the moon on 2032 Jan 3. 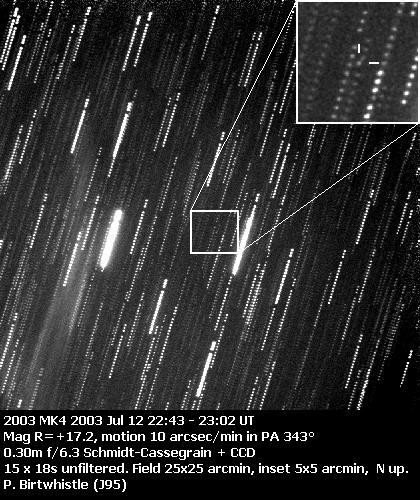 Fifteen individual short exposures were stacked to compensate for the asteroid's motion for the image above.